Even though this tutorial is named as Advanced Android Database, there is nothing advanced in Android database. 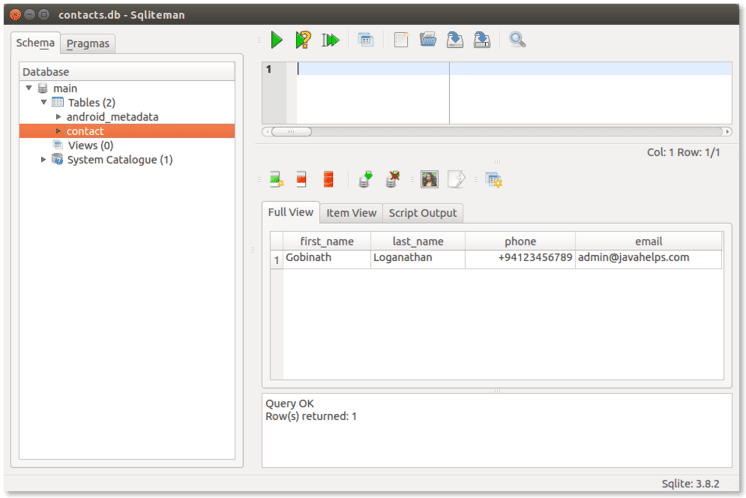 The last Basic Android Database tutorial explains the quick and dirty way of using SQLite database in your application. This tutorial uses the same problem discussed in the last article, but to explain the recommended way of database access in Android. The Create, Read, Update and Delete (CRUD) related methods are not explained in this article since those are already explained in the Basic Android tutorial. If you are new to Android Database, please read the Basic Android Database article first and then continue this article in order to learn the best practices. Download the provided template from this link. Right click on the db package and create a new class “DatabaseOpenHelper”. Modify the class as shown below. The abstract class SQLiteOpenHelper has two abstract methods and two overloaded constructors. The superclass constructor used in this class needs four parameters. The first parameter is the context of the application, which has to be passed from an Activity class. The second parameter is the name of the database file and the third parameter is CursorFactory, which is optionally requested if you need any custom Cursor objects. The null CursorFactory reference makes the Android use the default CursorFactory. The last parameter is the version of your database. Database version and application version are two different concepts. For example, assume that we released version 1 of this application as a Contact Manager. For the first time, our database version would be 1. Later we enhanced the user interface and released version 2 of the application. Since there were no changes in the database, still the database version would be 1. Database version will be changed only if there are any significant modifications in the database schema. When an object of SQLiteOpenHelper is created, it checks for an existing database with the provided name. 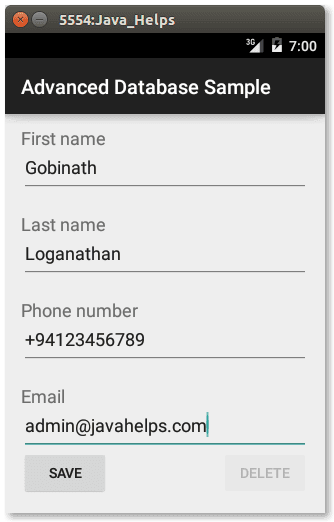 If the database file is not available, Android creates the database and call the onCreate method of the SQLiteOpenHelper instance. If you want to do anything on that time, write the logic inside the onCreate method. According to the provided code a new table is created in the onCreate method. The second method onUpgrade is used to update the database when a new database is released. Create another class 'DatabaseAccess.java' in the 'com.javahelps.sample.advanceddatabase.db' package. Add the following code into the class. The SQLiteOpenHelper is used to open the database connection. Singleton design pattern is used in this class to avoid multiple connections to the database. The SQLiteOpenHelper.getWritableDatabase() method returns a readable and writable connection to the underlying database. If you need to read the content only, you can use the getReadableDatabase() method. Add a new method insertContact to perform the Create operation. * Insert a contact into the database. Following method is used to retrieve all the Contacts from the database. * Read all contacts from the database. Add an updateContact method as shown below. * Update the contact details. Create a deleteContact method as provided below. * Delete the provided contact. 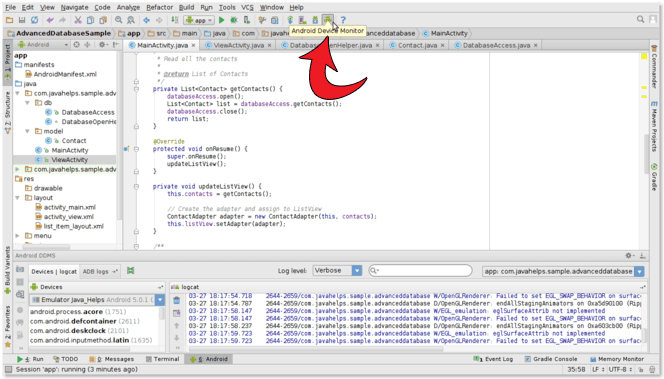 More details about these CRUD related methods are already explained in the Basic Android Database tutorial. After the modification, the final DatabaseAccess class must look like this. In the Mainactivity.java, create a new instance variable of DatabaseAccess and assign the object to it, from the onCreate method. Modify the getContacts method as given below. Create an instance variable of DatabaseAccess inside the ViewActivity.java. Modify the inserContact as shown below. Modify the updateContact method to update an existing Contact. Finally, modify the deleteContact method as shown below. Save all the changes and run the application. Find the completed project at Git Hub. In database-related applications, it is a common practice to manually read the content of the database to troubleshoot any issues with database connections. For example, assume that even after you insert a Contact detail it is not displayed in the ListView. In this scenario, the bug can be either in Create or Read operation. The easiest way to check the problem is, opening the database manually and check whether the data is inserted successfully or not. To manually open the database of an Android application, you need to create the database first. According to this code, once you run the application, a database will be created. 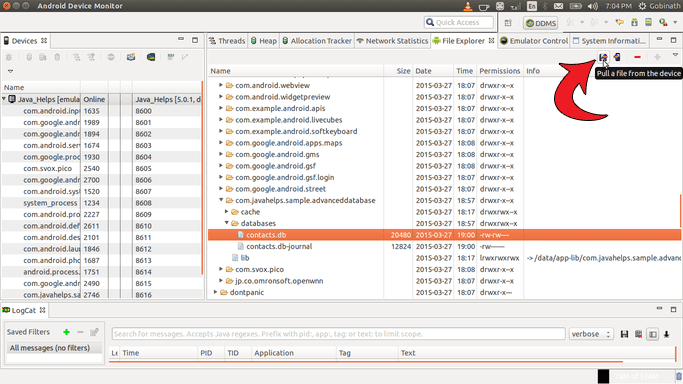 Once the database file is available, it can be exported to your computer using Android Device Monitor. Click on the Android Device Monitor button. 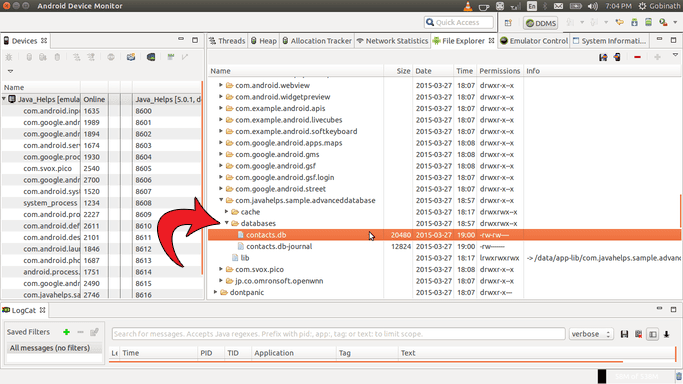 Select the contacts.db and click on the “Pull a file from the device” button. Save the file in your desktop. Hello, I was able to create a new database using CRUD operations. I am now trying to save this database on a SD card or any location. Do you have suggestions on how to go about doing this? I have tried looking that up but I was not able to get it done succesfully. Please help. Thank you in advance. Sorry for the late response. This StackOverflow answer can solve your problem. For your reference, I have added the code below which is modified to export the contacts.db created in this project to SD card. Thanks. It worked. Is there a way I can view these files that are being exported? which part of the code am i to call this??? how did you call this exporttoSD??? Add a new button to your application and call this method within the onclick event of that button. Is there no way I can update this file?? ?....like...after every update or...data been saved...it should automatically save in this file. If that is your requirement, call this method from the create, update and delete methods of DatabaseOpenHelper. There is no any life cycle methods in Android to do something when a database is modified. I don't know, if it will be possible just to update this external file, which will serve as a back up..for every update...without having to create a button that will export all the data that are already saved in the database. Sorry its my mistake, the class is DatabaseAccess. Add this method in DatabaseAccess and then try to call this method within the close method (After closing the connection). My DB SQlite Contain texts that showed in many fragments, , For that I need to make search for any word in my all data base and view all result in list view, all fragments have this word.